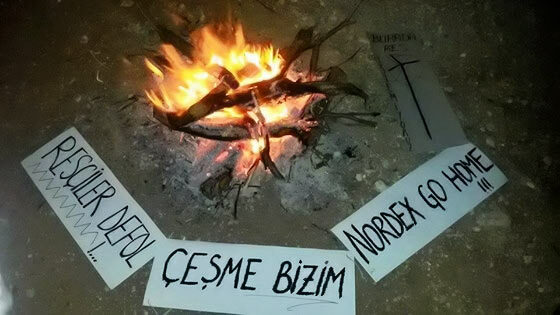 On the morning of 3rd October, the last day prior to the Muslim world’s Eid festivities and public holidays in Turkey, Turkish investor ABK Çeşme RES once again demonstrated their total disregard for law and made Unlawful Entry through private landowners properties, carrying Nordex supplied heavy equipment and parts into the contested wind power project areas. Fencing and prominent private property warnings which were erected last week by locals on their own properties to stop the illegal trespassing were not enough to halt ABK. The over-sized lorries ran over private fencing and proceeded to the construction sites via the illegally paved access roads ABK built earlier. It’s been reported that Nordex employees were deployed to the scene in aid of the ABK staff from the previous night, as the wily ABK management sought to seize the opportunity of public holidays due to the Eid. The wind projects that are being illegally developed in the region that have come so far without any public consultation, such as the one that ABK is pursuing, are subject to 25 or so on going legal cases that have been brought against them at various courts, including the High Court of Turkey as well as various lower and local courts. In addition to these, three separate courts have issued legally binding, and in effect, Stay of Execution decisions against the developer ABK Çeşme RES. 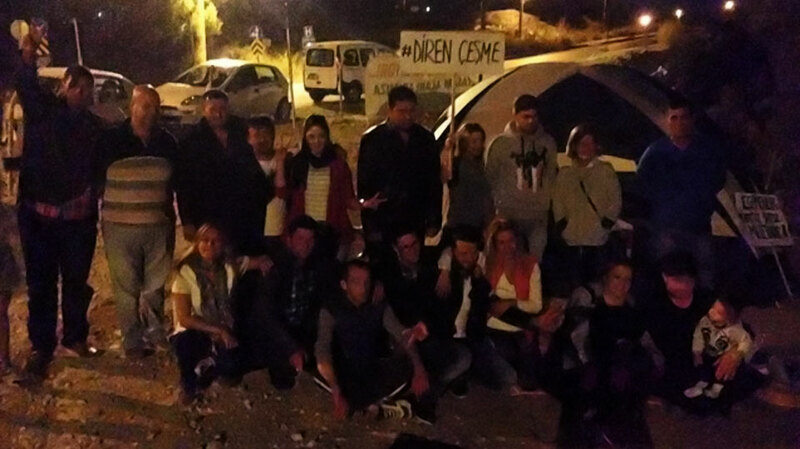 Çeşme’s locals have had to be mobilized to defend their rights and what’s theirs by themselves, due to the onslaught of these projects that are documented to be detrimental to the habitat, human health, and also the economy of a tourism destination such as Çeşme. Locals have had to abandon any hopes of enjoying the festivities of the Eid, and instead have had to leave their homes, families and loved ones to setup camp at the site, in an effort to stop the trespassing. They are intent on stopping any unlawful entry into their lands by forming a human shield if they are forced to. One of the campers who did not want their identity to be revealed put it succinctly: “These wind projects, infringing of local and international laws and of which the negative effects on humans and natural habitats is well known, should never be allowed. We’re going to be here day and night until the end, we will defend our rights! We ask all public authorities to take responsibility of their positions and to put a stop to this illegal activity on our lands”. In the past weeks, the same ABK company and their contractors had made unlawful entry into private properties, cut down trees, and dumped tonnes of excavations as they scrambled to build an access road to the designated site. 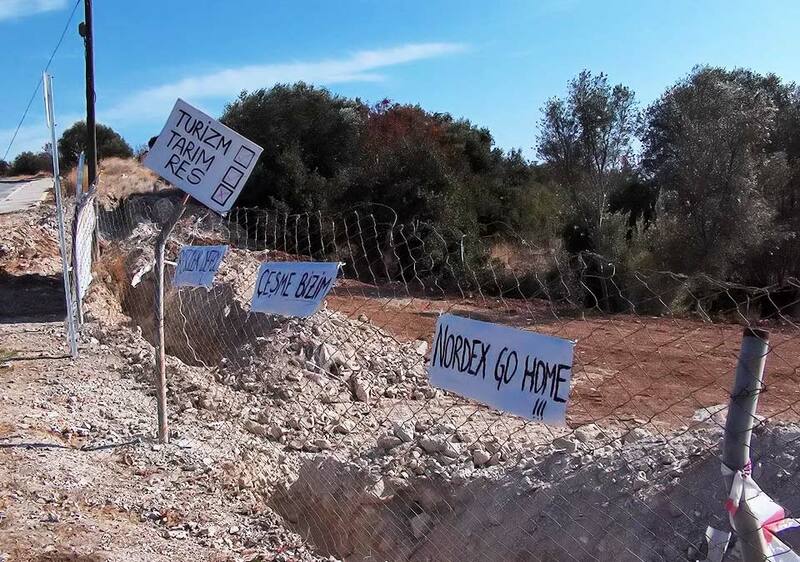 The fences, which were constructed by the locals on their own properties last week in response to ABK’s unlawful actions, proved to be of no use in stopping the second coming of the Nordex supplied parts on over-sized lorries (TIR’s). After demolishing the fences, ABK managed to succeed in transporting some of it’s cargo to it’s destination, all while clearly trespassing. In response, locals have been camping and keeping sentry at the site of the unlawful entry to make sure it doesn’t happen again. Enforcing the law with ditches on private land! Locals came together in the evenings, made campfires, and held discussions until the mornings at the site, during the Eid holidays. Tents which were erected at nights were packed away during the day, and it’s been observed that the lorries did not attempt to retry their unlawful actions again.